A simply classic 18ct white gold ring, channel set with 3/4ct of glittering diamonds. The Tolkowsky diamond is cut using a precision formula known as 'The Ideal Cut', ensuring maximum brilliance and sparkle in each and every diamond. The perfect wedding band to accompany a Tolkowsky engagement ring, or as an eternity ring for a loved one. Tolkowsky 18ct white gold 3/4ct I-I1 diamond ring is rated 5.0 out of 5 by 3. Rated 5 out of 5 by Anonymous from Beautiful! I love rings so my husband got me this one as a 2nd anniversary gift and I just love it! Can’t stop staring at it all the time! I got some discount on it as well which was cherry on the cake. 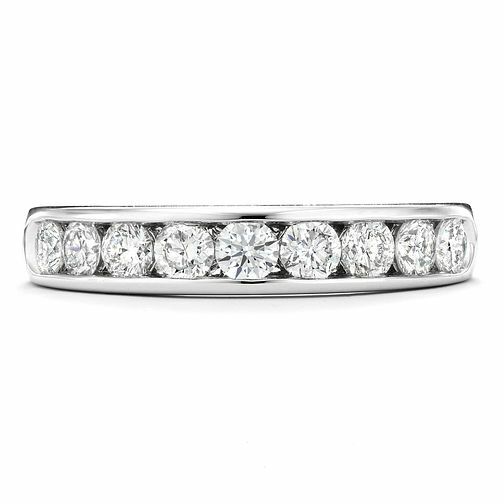 Rated 5 out of 5 by Anonymous from Excellent quality and sparkle Received as a Christmas present from my husband and couldn't have wished for a more beautiful eternity ring, excellent quality diamonds giving brilliant sparkle. Love it so much.